Greetings from the American Association of Geographers Annual Meeting! UVM Plant and Soil Science PhD Students Alissa White and Janica Anderzén from the Agroecology and Livelihoods Collaborative presented their work yesterday at the special sessions on agroecology organized by CAWR (Center for Agroecology, Water & Resilience) and ARC (Agroecology Research-Action Collective). The meeting featured emerging research on agroecological transitions and theories of change under the title “Agroecology Now!”. Janica and Alissa presented during the first set of presentations focused on context-specific examples of agroecology initiatives and networks. The rest of the sessions drew in speakers that offered complementary research on opportunities and challenges for making changes at multiple scales in the food system. 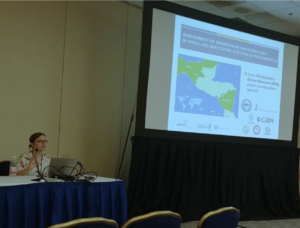 Janica Anderzén shared results from early phases of her research with the CESMACH coffee coop in Chiapas, Mexico. Janica’s research offers new insight into diversification as a livelihood strategy for dealing with the climate and market pressures that contribute to food scarcity in this region. She highlighted the role of beekeeping and subsistence farming to improved livelihood and food security. Alissa White presented findings from her research with farmer networks in the Northeastern US. Her analysis identifies networks as key drivers of farmer-led innovation in the region. 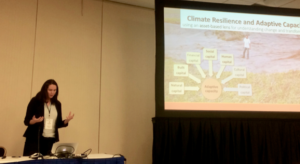 Based on emerging themes from focus groups, her research also explores the characteristics of networks that support the capacity of farmers to make change in the face of climate change. 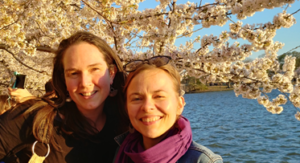 Author Emily HarringtonPosted on April 8, 2019 Categories UncategorizedLeave a comment on Greetings from AAG 2019! 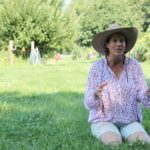 ALC lab member Alisha Utter was recently featured in the UVM Women’s Agriculture Network series discussing how she uses diversification and agroecology to manage risks on her farm in Grand Isle, Arbor Farmstead. Additionally, Alisha draws upon veganic practices, which excludes the application of animal inputs. If you would like to learn more about the principles of veganic growing, as part of Public Philosophy Week, Alisha is leading a discussion on veganic farming this Friday (3/29) from 5-6 pm at Knead Bakery in Burlington. All are welcome to join the conversation! ALC Undergraduate Fellows, Allie Pankoff ‘19, Elise Schumacher ‘19, and Alanna McLaughlin ‘ 20 recently put together a Womxn in Soil Science panel inspired by a #SoilScienceSocietyofAmerica presentation on the state of Gender Parity in Soil Science. Our motivation for the Womxn in Soil Science panel was to build community across the University by creating space for more experienced womxn soil scientists to share their experiences in the field. The event was initially inspired by The State of Gender Parity in Soil Science, a poster presented at the 2017 Soil Science of America conference, which highlights some eye-opening statistics on gender in the soil science fields. Our discussion centered on the experiences of womxn pursing professions in science; our panelists touched on persevering in the face of obstacles, the value of mentorship, and networking strategies. 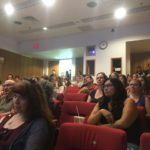 Over 20 people attended our first panel, indicating the need for these types of events and a stronger sense of community among womxn scientists at UVM. Attendees expressed excitement at the opportunity to learn about the lives of womxn in academia today, and were reassured that not all career paths are linear in nature. Looking into the future, there is a lot of room for growth! We hope to continue what we started, and to have more events that are geared towards other underrepresented identities in the sciences. 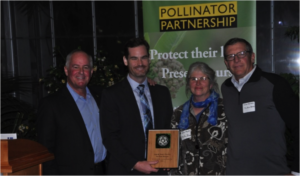 Nancy and John Hayden were recently recognized by the North American Pollinator Protection Campaign (NAPPC) with the 2018 Farmer-Rancher Pollinator Award for the United States. They received their Award at the NAPPC’s Conference in Washington DC. Nancy and John steward The Farm Between in Jeffersonville, VT, where they have farmed for the past 26 years. Today, the 20-acre property incorporates organic fruit production, an on-site nursery with native and pollinator-friendly plants, and a 14-acre pollinator sanctuary buzzing with diversity. In addition to farming, Nancy gains inspiration from the surrounding agroecosystem for her writing and artwork. Some of her fiber/fabric creations feature pollinators and the challenges they face, such as those in her “Pollinators in Peril” series. John, a trained entomologist, conducts research on-farm, often in collaboration with academic institutions and non-profits. 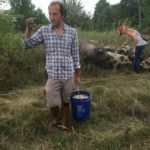 He also advocates for pollinators at the policy-level and presently serves on the Vermont Pollinator Protection Committee. 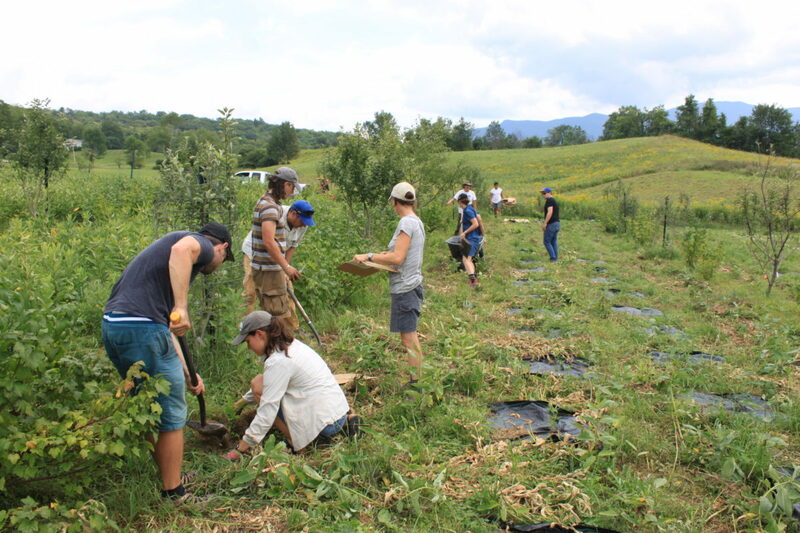 In 2007, Nancy and John founded the international non-profit, Seeds of Self-Reliance, and more recently developed Pollinator Pathways here in Vermont. Both efforts seek to promote pollinator diversity and habitat creation with emphasis on pollinators’ role in sustainable food systems. The ALC is fortunate to have had the opportunity to build a long-term partnership with Nancy and John as research collaborators on both local and international projects. 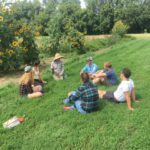 The Farm Between has served as a host to UVM agroecology courses for many years and the constantly evolving landscape remains a beloved exploratory space for students. Their passion for pollinators and commitment to engaging in agroecology as a science, practice, and movement are inspiring to many. Kudos to John and Nancy on receiving the 2018 Farmer-Rancher Pollinator Award – certainly well-deserved! Author Ernesto MendezPosted on December 18, 2018 December 18, 2018 Categories UncategorizedLeave a comment on We’re Back! 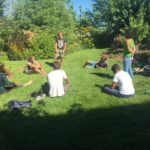 15 October, 2018 (Rome, Italy) – It is possible for communities, regions and whole countries to fundamentally redesign their food and farming systems – but doing so requires changes in the way communities envision their food systems, the way knowledge is shared, the way that food systems are governed, and the values underpinning them. 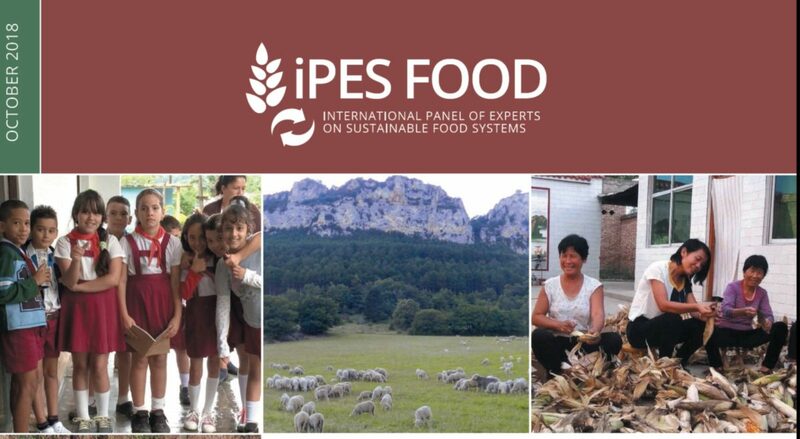 This was the message from IPES-Food’s new report, ‘Breaking away from industrial food and farming systems: Seven case studies of agroecological transition’, released on October 15th, 2018. 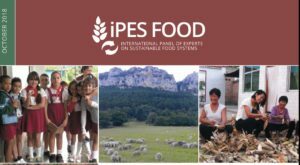 The case studies follow on from IPES-Food’s 2016 report, From Uniformity to Diversity, which identified the vicious cycles locking industrial food and farming systems in place, despite their severe impacts on human health, economic and social well-being, biodiversity, and climate change. The case studies provide concrete examples of how, in spite of these barriers to change, people around the world have been able to fundamentally rethink and redesign food systems around agroecological principles. 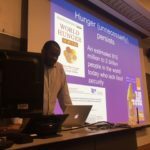 Political Agroecologist Dr. M. Jahi Chappell delivered an address to over 80 people at the University of Vermont (UVM), last Friday September 14. Jahi is a widely recognized agroecologist, with a diverse trajectory that includes being a professor at Washington State University, an analyst at the Institute for Agriculture and Trade Policy, and now a senior researcher at the Centre for Agroecology Water and Resilience (CAWR), at Conventry University, England. 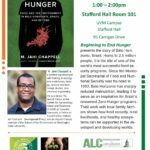 The talk focused on Jahi’s recent book, Beginning to End Hunger, which documents his experience on innovations and lessons to end hunger in Belo Horizonte, Brazil. The analysis also examines how this case study can inform similar work in other regions. His deeply transdisciplinary approach touched on issues of equity, policy and the need for academics, policy-makers, activists and social movements to work together to seek effective solutions to the pervasive issues of hunger and food insecurity. 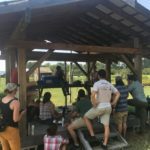 The talk was co-sponsored by the Plant and Soil Science Department, the Agroecology and Livelihoods Collaborative (ALC), the Gund Institute for Environment, the Food Systems Graduate Program and the Environmental Program, all from UVM (click on images to enlarge). 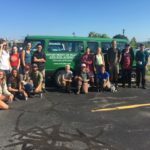 Today (August 31), was the first farm day for 3 teams of Advanced Agroecology (PSS/ENVS 212) students, as they headed out to Jericho Settlers Farm, UVM Catamount Farm/Farmer Training Program, and the Farm Between. 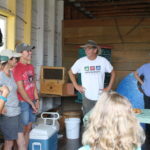 Students were going to meet their farmer partners, get an overview of the farm and start helping out by doing work as part of their service learning. 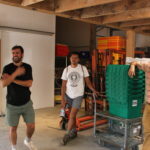 For the first time since the beginning of this course in 2008, each of the 5 farm teams is being led by an ALC undergraduate research fellow, who will be helping support all work on the farm, as well as the participatory action research (PAR) activities that are also a new component of the course. 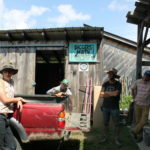 The other three farm partners are , Bread and Butter Farm and Digger’s Mirth Farm. 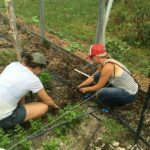 This year, the fellows are from the following UVM programs: 2 Environmental studies majors, 1 Food Systems major, 1 Ecological Agriculture and Food Systems double major, and 1 Environmental Science major (click on photos to enlarge). 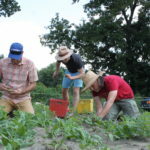 The ALC team recently concluded the first offering of PSS 311: Introduction to Agroecology, the first course of our Certificate of Graduate Study in Agroecology (CGSA). We had a great crew of 11 participants, from the U.S., Canada, Mexico and Puerto Rico. The course is a hybrid, with 3 weeks online, and 1 week face to face. 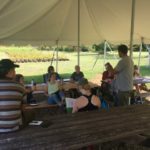 The face to face week was spent working and connecting with ALC Vermont partners, including The Farm Between, Diggers Mirth Farm, Bread and Butter Farm, the Intervale Center, UVM Catamount Farm & Farmer Training Program and the Vermont Community Garden Network (VCGN). 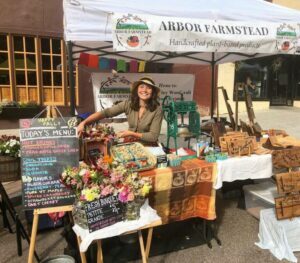 We connected over great local food from Blossom, Barrio Bakery, Bread and Butter burgers, and different vendors at Summervale, ArtsRiot South End food trucks and the Mendez-Nordstrom household. We are grateful for all the learning with the first CGSA cohort, and very excited to launch the remaining courses of the first full CGSA offering. Below we provide some images of a full and meaningful week (click on pictures to enlarge). 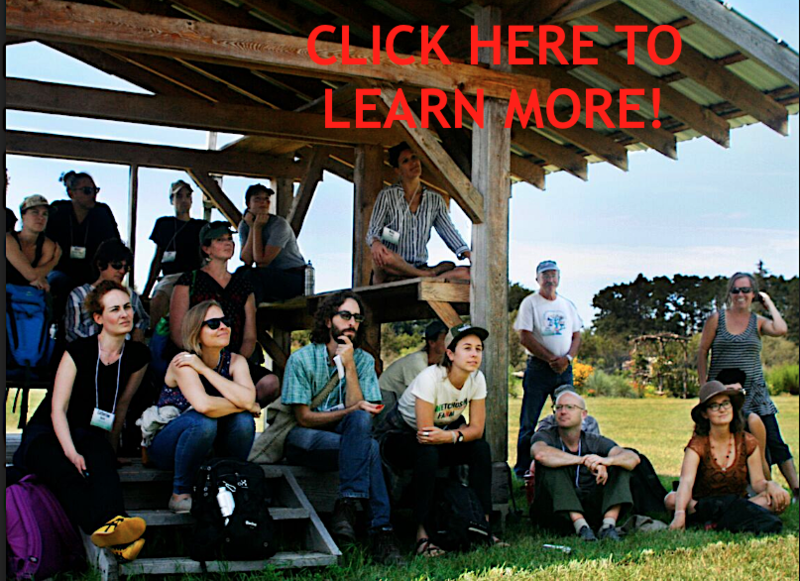 The Agroecology and Livelihoods Collaborative (ALC) is a community of practice within the Department of Plant & Soil Science (PSS) at the University of Vermont, which utilizes an approach grounded in agroecology, participatory action research (PAR), and transdisciplinarity. Our goal is to better understand and seek solutions to the issues facing our food system. The ALC program administrator reports to the faculty director and research & outreach coordinator, and works closely with the core team (faculty director, research and outreach coordinator, and educational coordinator), to manage communications and internal operations for the ALC, and to plan and implement the ALC’s research and educational initiatives. The program administrator will also provide some support to the PSS program, and will be a point of contact for ALC students, and other collaborators both within and outside of the university. 2-3 years of administrative experience. Strong public relations, interpersonal, and organizational skills. The ability to work well—whether by phone, email, writing, or in person—with a broad range of constituents both internal and external to the university. Willingness to be flexible and work collaboratively as part of a team. Ability to manage multiple tasks, meet deadlines and handle unexpected crises. Detail-oriented, with strong budget management and problem-solving skills. Sensitivity to issues of equity and diversity. The ability to plan, prioritize, and balance the workload of several projects simultaneously in a fast-paced environment. Experience with UVM’s business and financial applications and systems. Familiarity with UVM’s administrative organization and academic programs. This is a part-time position, 20 hours per week, at $18 per hour. We regret that we cannot provide benefits.